I honestly can't believe that Isabella is now three years old and classed as a 'pre-schooler' rather than a 'toddler' - where has the time gone? Since turning three her level of interest in the world and learning as much as possible has noticeably increased, as we are greeted with around 10485943 questions a day. It always fascinates me quite how quickly children learn new things; they're like sponges at this age. Due to this it makes it the ideal age to start introducing key life skills, such as counting and phonics. I'm not talking sitting down and working through workbooks for hours on end, but more exploring the world with a slight twist. 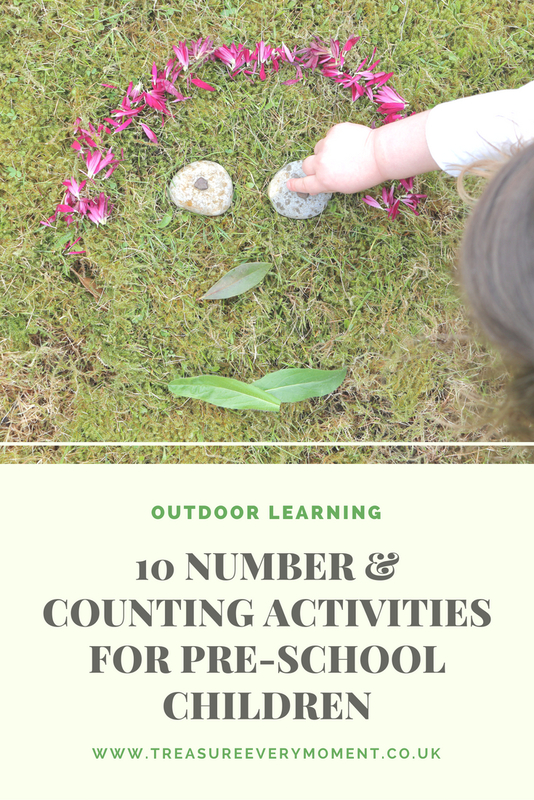 As a family we spend a lot of time outside, which makes it the perfect place to start learning all about numbers and counting. Many of these activities can be done without the maths twist for younger children, but if you do want to start teaching your child how to count then these are fun and easy ways to. It's all about adding a few questions here and there, which if your child is like mine they will love trying to answer. 1) Hole Punch Leaves - Go on a leaf hunt and collect as many as you can that are on the larger side. In the middle of each leaf write a number using a permanent marker, then ask your child to use a hole punch to put the right number of holes into each leaf. This practices number recognition and fine motor skills. 2) Can you find? Hunt - Can you find 4 leaves? Can you find 2 stones? Can you find 1 worm? Can you find 10 blades of grass? etc. 3) Rubber Duck Race - Write numbers below 10 on the bottom of a few rubber ducks. On a rainy day find a puddle to race the ducks and when one passes the finish line as your child to identify the number on the bottom. 4) Make Nature Faces - Use items you can find in your garden (sticks, flower petals, stones, grass, bark etc.) to make funny faces. During making them ask your child how many stones they've used to make the smile? How many different items have they used to make their face? etc. 5) How many peas in the pod? - You may have peas growing in your garden, but if not you can pick up a bag of pea pods very easily from the supermarket. Show your child how to open one and count how many peas are inside; they can then open each one and count how many are in there, before placing the peas in a colander ready to cook. It's also a fun way to show them where peas come from. 6) Disappearing Chalk Numbers - Water is the best way for children to enjoy mess-free painting outdoors, so if you have a patio area or wall accessible then write different numbers in chalk and ask your child to see if they can recognise the number and then make it disappear?! 7) Ice-Cream Sand Scoops - Take a few plastic cups or ice-cream cones if you have one, as well as a spoon or play ice-cream scoop. On the plastic cups write numbers 0-10 and then ask your child to see if they can put the right number of scoops into each cup/ice-cream cone. 8) Mix up a Potion - Gather together different items from around the garden and put into a cauldron (or bowl to me and you). Mix around while muttering a spell, with your child counting in the different items as they're added. 9) Daisy Footprints - Draw around your child's foot onto some spare cardboard and cut it out. You will be left with a foot shaped window in the card, which can be dropped onto an area of grass that daises grow and they can count how many have landed within their footprint. 10) Pebble Hop - Two people (you and your child or siblings) stand on a start line, while a finish line is marked a bit of a way away. In a bowl have an array of pebbles with different numbers written on them. Each of you pick out a number, read it (or have dots on it if your child isn't able to recognise numbers yet) and then jump forward that number. Repeat until one of you has reached the finish line. Which outdoor activities are your child's favourite? Great ideas and we love mixing up potions and pretending to be witches, so this would be a good counting game for us! Oh I love this! It reminds me of a quote I saw today that a classroom doesn't always have four walls! Lovely ideas. I always think the joy of outdoor learning is that they don't really notice that they're learning! These make learning more fun and motivating for the kids. Learning is really not just inside the classroom. Really fun and creative ideas for little ones. My son is 3 and I am sure he'd love doing these.